Emma Maugham moves to Paris to study...At least, that's what she thinks when she moves into the little attic apartment in a building owned by the mysterious multimillionaire Charles Delmonte. Like a magnet, subjected to an uncontrollable attraction and then a sudden separation, Emma discovers the sensuality of an sensual relationship in the arms of the young and handsome Charles...but where is this going to lead? I had heard good things about His, Body and Soul, so I was interested to read it for myself. Even though it is a short read, part of a bigger series, I couldn't help but get drawn in by this story, even with only 36 pages in this first part volume. The story starts with Emma who is beginning her thesis in Paris, France. Emma will be staying in a small yet luxury (compared to others that is) apartment that her cousin, Lexie managed to get her. Although, when she meets the handsome Mr Charles Delmonte, she is in for a shock. He is completely different to how she expected, he was young for one not older like she had presumed. But even with his drop dead gorgeous looks, he really needs to work on his people skills. Even with her growing hatred towards Mr Delmonte, she still has her work thesis to work on and her friend Manon to cheer her up when needed. Although, it isn't long before Emma starts to feel something for this handsome man, though he is a mystery and he makes Emma unsure about herself when she is around him. Then, Emma takes a chance which turns into everything she never knew she wanted, Although, things turn complicated quickly when Emma witnesses something, though is it really what it seems, she doesn't know what to believe. 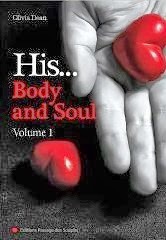 His, Body and Soul #1 is the first in this passionate story that is set in Paris and is filled with tension and lust. I can't wait to see what happens in the next part of this electrifying story. If I had to sum this book up in three words, they would be Passionate, Thrilling and Unforgettable.